None – The artwork will be printed “as is”. No color correcting or other adjustments will be done prior to printing. Sliver – A narrow segment of the artwork will be printed on the selected substrate. 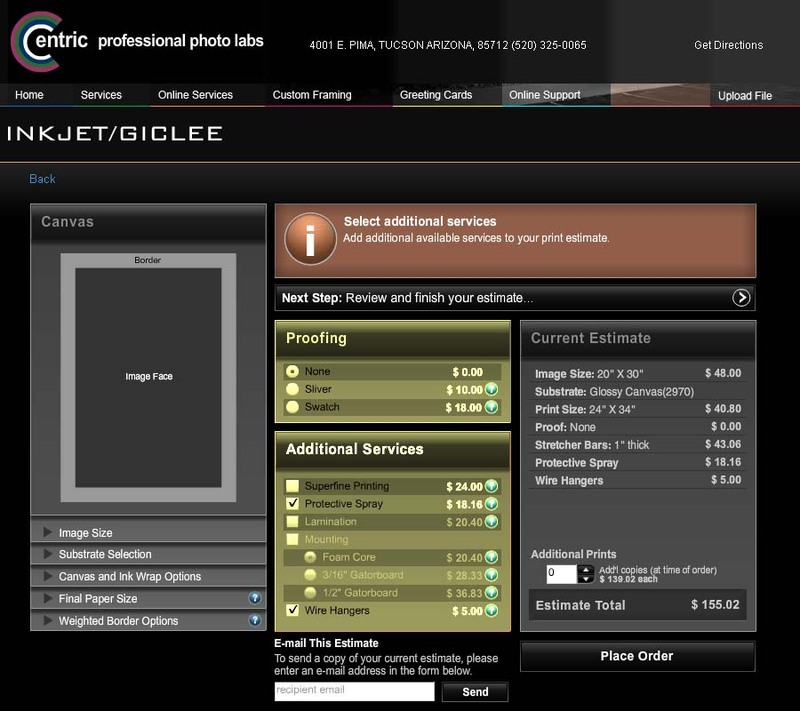 This allows you to see preview the color and detail before approving the final print. No changes are made to the image without your instruction. Upon your approval, we will complete your order according to the normal production schedule. Swatch – A swatch on the selected substrate provides small samples of various color and density (darkness/lightness) options for you to preview. Additionally, it includes an 8/10 version of the complete image with no corrections, as well as a segment of the uncorrected image at full size, showing the detail of the final printed product. Upon your approval of specific color and density adjustments, we will complete your order according to the normal production schedule. Superfine Printing – For the finest quality prints, superfine printing doubles the amount of ink used in printing your artwork and is particularly useful when reproducing gradients, such as skies. Protective Spray – Available in a satin finish, a protective spray is highly recommended for canvas prints as it increases print durability and reduces fading that may occur as a result of exposure to ultraviolet light. Lamination – An excellent finishing touch used primarily for prints on photo paper, lamination serves the same purposes as the protective spray does for canvas – it improves print durability and reduces UV fading. Available in satin or gloss finishes. Mounting – Your print can be permanently mounted on economical 3/16″ acid-free foam board or high-density, durable Gatorfaom® board. For larger pieces or artwork that will be displayed without a frame, we recommend using 1/2″ Gator board. Wire Hangers – A wire hanger will be attached to the back of your stretched canvas or mounted photo print, ready to hang and display.